I first wrote about wanting a content management system for a virtual environment in 2009, when I was just getting started in OpenSim. I’m revisiting the topic now because I’ve continued to think about it ever since, because nobody has built one yet, and because the imminent arrival of the Oculus Rift and similar devices is going to create a lot of demand. But first, what is a virtual content management system? A traditional CMS allows a company or media organization or individual blogger to manage website content. There is usually a default configuration and customization options. The content is arranged in a specific way — headers and menu bars on top, footers at bottom, sidebars to the right. While this makes many websites look similar to all others, it also allows users to easily navigate sites and find content. Most CMS platforms also allow administrators to deploy different templates, manage user posting privileges, add plugins and widgets, and even add sections that are hand-coded HTML. A VCMS would do all of the above except for 3D content instead of text and graphics, plus keep track of content licenses, event schedules, and user groups. Traditional CMS platforms typically do not keep track of content licenses because web sites either repurpose existing content, which has licenses associated with it, or are work-for-hire projects. Similarly, calendars and custom user groups are usually available as add-ons or plugins and are rarely part of default configurations. A traditional CMS manages administrative content, such as templates, headers and color schemes and other configuration options, plugins, and widgets, in addition to user-generated content such as posts, pages, tags, and comments. For a VCMS, administrative content would also include templates for regions and structures, customization options such as logos, color schemes, and landscape seasons, navigation elements, and other assets selected or designed by grid administrators. User-generated content would include images and URLs displayed on in-world screens inside offices and other structures, items built inside sandboxes or uploaded by users, items placed inside buildings and other facilities, and event schedules. A major difference between the two approaches is that a grid that uses this kind of content management system — such as corporate and college campuses — is going to see most of its value in live interactions between users. I can see a commercial grid using CMS templates to create central administrative and office regions, however, and leave the rest of the grid as sandboxes for building by particular groups or individuals. Another difference is the need for licensing and permissions. A very useful feature would be the ability manage all the individual items of content on a grid — buildings, furniture, clothing, and other assets — in an easy, centralized way. For example, a VCMS could allow administrators to track the license terms of all content, set default permissions based on user groups for particular categories of content or for individual items, remove items or entire categories of items from the grid, and replace items with never versions. The VCMS could also allow administrators to sort and search for items based on location, or group or user inventories. Currently, these types of actions are typically only possible to people who are extremely knowledgeable in database management, making it difficult for schools or companies to manage the content on their own grids unless the grids are very small, or they have that kind of skill in-house — or hire external developers or hosting companies to do this work. A Web CMS typically allocates certain areas as places where users can post content — posts, pages, comments, and so forth — and treats these places differently. Similarly, a VCMS could classify areas where users can place or move content as interior and exterior spaces, underwater spaces, as display screens, or as sandboxes, with different default permissions attached to each. Exterior spaces, for example, might be subject to weather conditions, at such time as OpenSim gets weather. One of the best features of a Web CMS is that administrators can make a single simple change, and immediately see it reflected on all the site’s pages. This was extremely difficult to do back in the days when all sites were hand-coded HTML. Fixing a broken link in a menu required updating every single page where the menu appeared. I used to do this a lot back in the day, and nothing made me happier than when Dreamweaver came out with its ability to create page templates. Today, grid managers have to use similar work-arounds when they need to modify many items of content at once. For example, many grids use manually-coded navigation boards to help their users travel around the grid. When destinations move, or get renamed, each of these boards has to be updated manually. 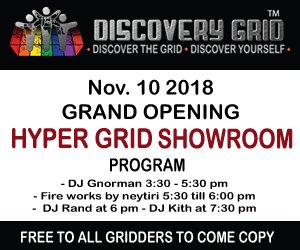 To deal with this, some grids use scripted teleporter systems. 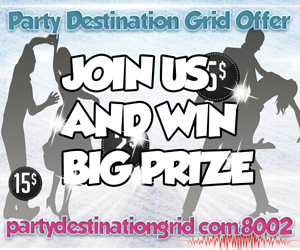 Similarly, a grid might have promotional signs in several areas, announcing upcoming events or sales. When those signs have to change, someone has to manually go around and replace all the textures. Again, a work-around is to script the signs so that they pull in images from the Web, so that if the file is replaced with a new one, all the signs would immediately reflect that change. Trees and flowers might be scripted so that they automatically change with the seasons. A VCMS, however, would automatically create a navigation system and keep all signs and teleport boards updated without any extra work on the part of admins. Similarly, a VCMS could automatically create signage for upcoming events, and allow administrators to update all on the landscaping on the grid with a single click. In addition, a VMCS should be able to track premade regions, uploaded in the form of OAR files, and allow them to be easily moved around on the grid, or removed from the grid and put into storage. Finally, a VCMS could allow administrators to update the corporate logos and color palettes and instantly have it reflected in-world, with buildings and signs and other permanent features automatically updated with the new images and color schemes. By default, Web CMS platforms offer a variety of Web page elements that administrators can easily place on their site. This includes headers and footers, menus, sidebars and sidebar widgets. Additional elements are available via easy-to-install plugins. On a grid, similar elements could be stores, meeting spaces, personal offices, and landing points that are dropped down into predefined areas on a region. 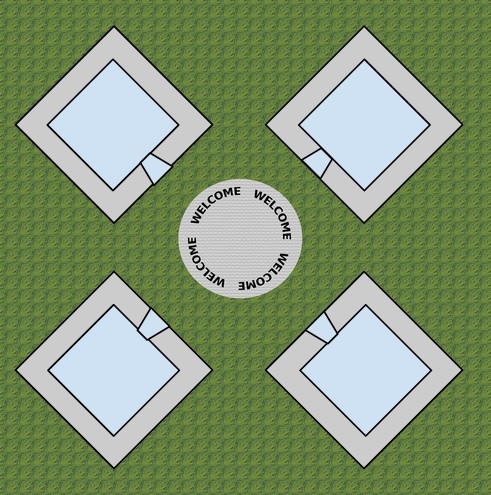 For example, below, there’s a “welcome” landing point in the center, surrounded by, say, four buildings — an avatar store, a land rental office, a cafe, and a support center. One way to do virtual world templates is to have all buildings fit into a limited number of fixed footprints. All content inside would then be associated with that building and managed accordingly. Other prefab buildings could include auditoriums, conference rooms, dance halls, galleries and bars, each automatically labeled, styled, and colored according to the customization settings. The first themes are going to be ugly and utilitarian, good enough for schools and non-profits to set up basic grids for meetings and collaboration, but just barely. As designers get better at working within the constraints, and the VCMS developers add more customization options, the grids will start to look better. It still won’t replace individual design, just as today, many commercial websites are completely custom-built and might use generic CMS platforms only for certain sections, like blogs or forums. Roleplaying grids and other gaming grids, for example, will probably be fully custom-made. I was a staffer at a major computer magazine during the dot-com boom, and I remember hearing of one publication spending a millions dollars to install Vignette, which was then one of the best content management systems around for websites. A million dollars, for something that didn’t do a fraction of what a free, open source CMS does today! I estimate that the virtual environment boom will hit about five years after the Oculus Rift and similar devices go into mass production. For the five years after that, until it peaks, we will have a sweet spot for commercial VCMS platforms. VCMS developers will be making money from software licensing fees and customization work. In addition, they can create app stores through which third-party developers and designers can sell themes, plugins, prefabs, and other content designed to work with their platforms. I recommend that people who build these sell before the inevitable bursting of the v-commerce bubble, cash out, and then focus their energies on open source VCMS platforms for the masses. Once the technology gets commoditized and everyone starts switching over to free, open source alternatives then the revenue models will change. As with WordPress or Drupal, VCMS developers will be able to sell consulting services, customizations, and support. In addition, third-party developers can create and sell themes, landscaping packs, prefabs, and other content designed to work with popular VCMS platforms. In addition, we might see ad-supported platforms, like Blogger or what used to be GeoCities, where the VCMS is free and part of the hosting, but visitor behavior is tracked and analyzed, and there is advertising all over the place.